Increasing demand and the need for more effective ways to prevent the spread of germs has fueled Glaro Incorporated’s launch of a new line of innovative disinfecting surface wipe dispensers, wipes and waste receptacles. Distributors and dealers can begin to offer the product line for sale immediately. Hauppauge, NY–Glaro Incorporated’s new wipes dispensers and wipes product line is the ideal solution for public and private facilities that value keeping their buildings healthier and safer for visitors and employees. 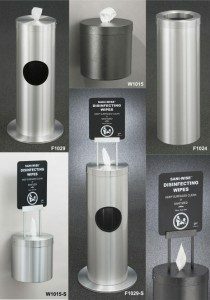 The line includes sleek, metal wipes dispensers, FDA approved disinfecting surface wipes, and a number of matching and coordinated waste receptacles. The new product line is designed to be the total solution for disinfecting surfaces in any public or private location. Constructed of heavy gauge aluminum and steel, and finished with rust and tarnish proof finishes, the line is ideal for use anywhere. 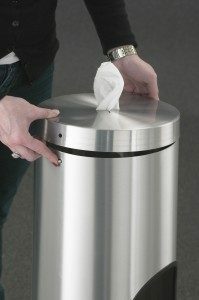 A combination floor standing wipes features a dispenser on top and a side opening for waste disposal. A wall mounted wipes dispenser is also available. It can be used with a matching or coordinated waste receptacle placed beneath it or nearby. Glaro Inc. also offers special signage that comes mounted onto wipes dispensers to encourage their use. Custom logos can be added to the wipe dispensers to create a unique, branded appearance. Surface sanitizing wipes are available (800 wipes per roll) in stock. These FDA approved wipes are designed to kill Staph, MRSA and HIV-1(associated with AIDS), HBV (Hepatitis B Virus), and HCV (Hepatitis C Virus), to name a few. They are ideal for cleaning soiled equipment, objects, and surfaces. 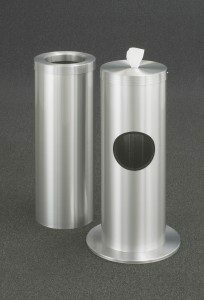 A selection of matching waste receptacles are available in several sizes and designs. 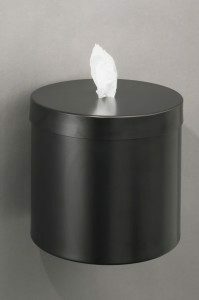 These waste receptacles are designed for use below wall mounted wipes dispensers or anywhere. The new Glaro Inc. product line was carefully engineered so that it is both easy to use and easy to maintain. Features like a push button release for easy refilling, a receptacle body that can be easily lifted off of its bass, and a star slot opening that only dispenses one wipe at a time, make the line unique. In addition, a double push button system that secures the top cover to the body ensures that covers will never lift off when wipes are pulled. The wider bass design, along with a weighted bass, ensures the product will not readily tip over or easily be moved out of place. All parts are rust-proof, and they are corrosion and fire resistant. Streak-free finishes are easy to clean and maintain.